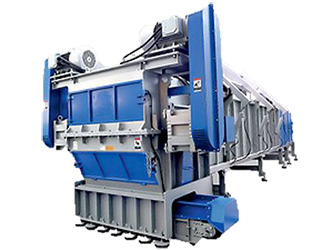 The P Series shredder is the world’s first single shaft shredder capable of handling many types of large diameter forms such as reclaimed pipes. Dependent on the item’s diameter the P Series rotor diameters and widths range from 800 mm up to 1500 mm. The standard hopper accepts lengths up to 6 m. The combination of advanced controls, low rotor speed and smooth hydraulics create a reliable and easy to use system. The main focus of the P Series shredders is the shredding of large diameter pipes or bundles of smaller pipes and profiles made from HDPE, PP and all kinds of PVC. Further the machines can be used for recycling of other plastic parts, such as large lumps, stacked wheelie bins and pallets. In combination with other size reduction equipment such as granulators and pulverizers we are able to provide a complete turn key recycling solution. The P shredders use larger concave ground square knives, producing high quality output. The cutters can be turned after a side is worn out. All Virtus Equipment shredders are equipped with our E-style flat rotor. The knives are fixed in special knife holders fitted in machined pockets. Optional weld on hard facing is available for abrasive applications. The P shredders feature a high-powered, twin-speed hydraulic system. This system ensures maximum pressure when feeding material into the rotor and high speeds on the backstroke.